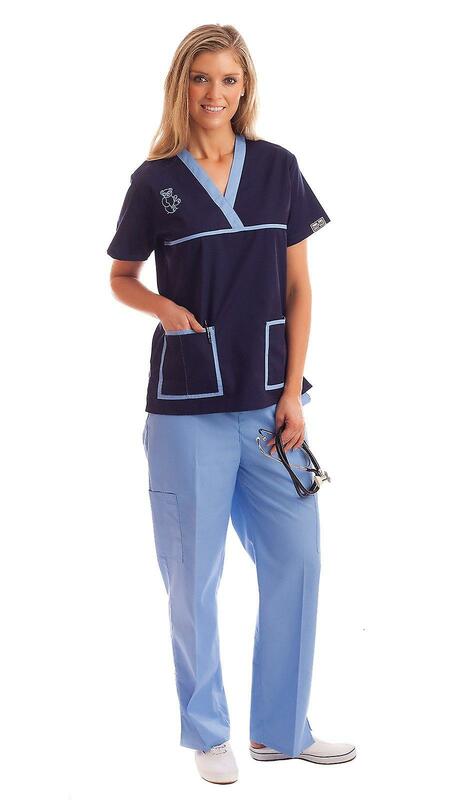 This Dress A Med women's scrubs set is made for durability and comfort-ability. Hands down, it features one of the best tops we have. Not only is it pretty but it is also reinforced with a double stitched V-neck cut, making it durable and resistant to any normal wear damage. The top has 2 patch pockets and a pen slot which are perfect for keeping any items you use regularly, conveniently close. The scrub top also has a back waist drawstring that can comfortably be customized to your desired waist size and is easily adjustable. No, you do not have to be boxed out in the old school scrub top anymore. Neither do you have to worry about ruining your scrubs during one of those high-intensity work shifts. The paired scrub bottoms are comfortable and fully functional. These pants are perfect for someone who is always on the go. They are straight leg so they are breathable and have flow without looking slouchy. The elastic waist makes for a comfortable fit while the convenient drawstring allows you to secure them to the level of your discretion. The pants also come with 2 cargo pockets which are large enough to keep bigger items close, such as your phone or wallet. The pants have 2 additional slanted pockets which make access to stored items within your pants easy. As standard with every Dress A Med medical uniform, we only use high thread count liquid repellent fabric and fade proof/reactive dye. All of our fabric is preshrunk and wrinkle free, making them ready to wear out of the dryer. We also use double stitching to make sure your uniform will never fall apart. Every design has been specifically and exclusively designed by Dress A Med. 100% satisfaction guaranteed on our quality.